The main reason for this is that stores offer limited variations of models because of the huge variety of sizes, which manufacturers should produce to fit the different characteristics of the male body. Stores just can't keep in stock so many models in different colors, patterns, sizes and shapes, because there is a huge number of combinations (The men's suit is produced in 14 sizes by bust, 6 by waist and 6 by height – totally 503 combinations for every model. And if they should keep in stock 30 models, made of 300 different fabrics and colours, this makes more than 4.5 million combinations). And that's why the shops offer just several models, mostly in black, gray and blue, in several dimensions and men wear mainly the same suits, and 90% of them wear suits which don't fit well. However, the market share of suits for the office is really big and people would like to show their personality through their outfit. Only in Bulgaria and Romania more than 50 000 suits per day are manufactured, which is just a tiny piece of world's producing of men's suits. That's way the Men's style project aims to show that the men's suit can be modern and practical at the same time. The project offers to fashion designers to become a part of the industry and the market for men's suits and to run away from the typical black color. 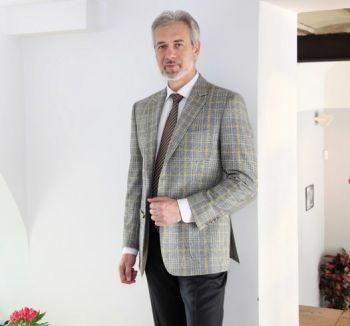 Contestants' models will be sewn from one of the largest manufacturers of suits in Europe - the factory for men's suits Richmart in Bulgaria and will be sold in an online platform to customers from all over the world. Suits will be made-to-measure and will be produced within 3 weeks and delivered directly to cutomer's address.